Justin Time Tree Trimming is proud to offer full service holiday and Christmas decorating and Christmas Light Installation. 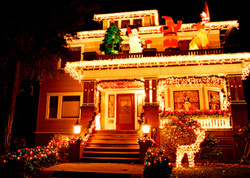 Our trained professionals have years in the tree and Christmas light installation business. We offer free quotes on every installation we undertake and look forward to earning your business year in and year out. So call us today to speak with our owner, Justin Bills. We offer same day service just in time for Christmas! Our locally-owned tree service has been handling residential lighting needs for years now and have testimonials and references from satisfied customers across Fort Worth, Arlington and the mid-cities available upon request. No job is too big or small for our team. Other cities we service include Argyle, North Richland Hills, Keller, Coppell, Grapevine, Colleyville and more. Remember to ask for references no matter which lighting company you decide to go with - we have dozens!